Larry Grayson’s high-camp, exceptionally English sense of humour made him one of the stars of Light Entertainment. Loved by the public, he achieved TV fame in the early 1970s, when he himself was in his fifties. Basing his act on the same one he had used to great popularity in working men’s clubs and on the revue circuit, he would spin tales of his singular friends, Everard, Slack Alice and Apricot Lil – his razor-sharp observational comedy tinged with a saucy sense of wickedness. Getting his big break on ATV’s Saturday Variety in 1972, he soon got his own series, Shut That Door!, which was swiftly followed by The Larry Grayson Show for LWT. For five years he reigned supreme as television comedy’s King of Camp, and this set includes both series of The Larry Grayson Show, Larry’s Hour of Stars, the sole surviving edition of Shut That Door! and much more. 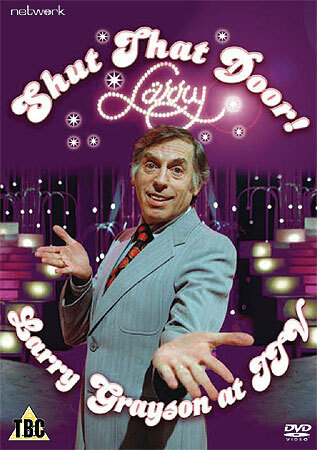 Shut That Door – Larry Grayson At ITV is priced £22.51 and is available from Network here. To read my review for Den of Geek, click here.